RRP £85.00 Sleek and seamless in the upper, stable and cushioned below, these running shoes blend comfort with durability. 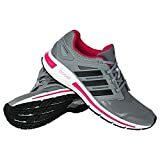 A techfitTM upper delivers sock-like fit and flexible support, while boostTM cushioning releases energy from each stride into the next, for lasting energy The adidas Revenergy Techfit is a lightweight running shoe that has been built to deliver a lighter and faster run with more energy. It is designed with a revolutionary new BOOST midsole unit which provides more energy return than any other foam cushioning material in the running industry. It combines soft comfort with responsive energy and gives you an amazingly soft and bouncy feel that isn’t over-cushioned. The BOOST midsole unit is also 30% more temperature resistant than EVA, allowing it to retain its composite structure better, improve performance in varying conditions and enhances durability. Features a textile upper with a breathable air mesh heel and collar for comfort and ventilation, and welded synthetic overlays for support and stability. Also features a TechFit upper that stretches and adjusts to the shape of your foot ensuring a comfortable and sock-like fit as well as flexible support. The external heel counter offers a snug heel fit, support and stability. The TORSION SYSTEM provides energy return in the forefoot and midfoot support. The BOOST midsole’s energy-returning properties keep every step charged with an endless supply of light, fast energy. The ADIWEAR rubber outsole offers the ultimate in high-wear durability and delivers traction. This running shoe is miCoach compatible so you can track all aspects of your performance.